After breaking up with her bad-news boyfriend, Reagan O’Neill is ready to leave her rebellious ways behind. . . and her best friend, country superstar Lilah Montgomery, is nursing a broken heart of her own. Fortunately, Lilah’s 24-city tour is about to kick off, offering a perfect opportunity for a girls-only summer of break-up ballads and healing hearts. But when Matt Finch joins the tour as its opening act, his boy-next-door charm proves difficult for Reagan to resist, despite her vow to live a drama-free existence. This summer, Reagan and Lilah will navigate the ups and downs of fame and friendship as they come to see that giving your heart to the right person is always a risk worth taking. A fresh new voice in contemporary romance, Emery Lord’s gorgeous writing hits all the right notes. I think I’ve said it here before: I like band books – Books with bands, books about music, books about friends with singers. My secret dream of being a roadie or a band manager is still hanging around, but because I don’t think I can handle the stress of all of that, I live vicariously through fiction. I’ve heard a lot of good things about Emery Lord’s Open Road Summer, but it’s been a while since I last tried a contemporary YA book from a new author. I like tried and tested ones, plus most of the contemporary YA now are NA, and I’m not a super fan of NA. But I had Scribd subscription that was about to expire, so I need to make use of it. I picked Open Road Summer from the selections, because of the good reviews, plus singers! The book tells the story of Reagan, who’s trying to turn over a new leaf by joining her friend Dee aka Lilah Montgomery, country superstar, on her summer tour. Reagan is nursing a broken heart, and so is Dee, so the summer was their time to bond and to help each other heal. But the music industry is a big, crazy ground for seemingly fragile Dee, so her management brings in Matt Finch, childhood friend and the guy who makes Reagan rethink her plans of a boy-free summer. 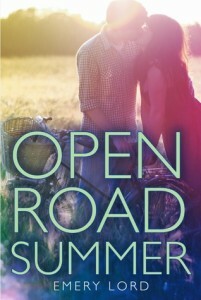 I enjoyed reading Open Road Summer because it was so easy to get into. It was so easy to feel like you’re in the bus with the girls, or in the audience or the backstage, and it was so easy to fit in the Reagan and Dee’s friendship. Figuratively, because if Reagan were real and you tried to be friends with Dee, I bet Reagan would have snapped at you. With all of Dee’s charm, Reagan is very abrasive to the point that it was almost annoying, and I wanted to tell her, “Chill out, girl. Not every girl is your enemy.” She was judgy, and at times harsh, but she had a heart devoted to Dee all the way. Their friendship was my most favorite part of the book. I liked how they were for each other, and how even if they had a fight, they were still for each other. This kind of friendship is rare, and it’s really a good thing to have one in the midst of a broken heart. My favorite parts were always when the two of them were together, and how Reagan watched Dee stand up for herself, and how Dee pushed Reagan to be slightly softer towards Matt, and softer towards herself. The romance was cute, in a slow-burn kind of way. I really liked Matt, and while I’m not a country singer, I would have probably been a fan of his given his description in the book. I liked how he sparred with Reagan, not backing down from her jabs, and how he stood up to show Reagan that he really cared. The grand gesture at the end really made me smile, too. And as with any book with music, I wished the songs here were real! I really liked the lyrics, and I wished that they also released a soundtrack to accompany this. It’s just right for books like this, don’t you think? This is the currency of friendship, traded over years and miles, and I hope it’s an even exchange someday. For now, I do what all best friends do when there’s nothing left to say. We lie together in the darkness, shoulder to shoulder, and wait for the worst to be over. The exploration of guitar chords, Matt’s low voice, and Dee’s hoarse giggling make a summer soundtrack I’ll replay even when the tour is over—in the moments when I feel like being truly happy is an impossible puzzle, one I’m not meant to figure out. If you have a best friend you can laugh with and a few good songs, you’re more than halfway there. It takes a long time to learn someone. It takes a long time to see a person as a whole spectrum, from worst to best—from the mismanaged heartache that lands them in AA to the pancake dinners, from the hurtful things shouted in a dressing room to the huge-hearted strength that only a best friend can understand. Once you get there, it’s forever.